Operated by the Cumberland & Falmouth Farmers Market, the Cumberland Farmers Market is open Saturdays, 10:00am-1:00pm, at 290 Tuttle Road, outside Cumberland Town Hall from May 11 – October 26. They also operate a farmers market in Falmouth on Wednesdays from 10:00am-2:00pm at 22 Hat Trick Drive behind Walmart from May 15 to October 30. Quality Maine goods and fun for everyone! Over 20 vendors sell seedlings (in-season), plants, flowers, veggies, fruits, local honey, snacks, baked goods, jams, chutneys, cured meats, seafood (including lobster! ), crafts, fibers, soaps, etc. Check them out! Also, operated by the Cumberland Farmers’ Market Association, the Falmouth Winter Farmers’ Market offers local, seasonal goodies galore! The winter market is located in the greenhouse at Allen Sterling and Lothrop, 191 US Route 1. 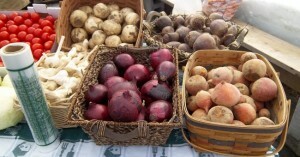 The market is open Wednesdays from 11:00am- 2:00pm, November through December.